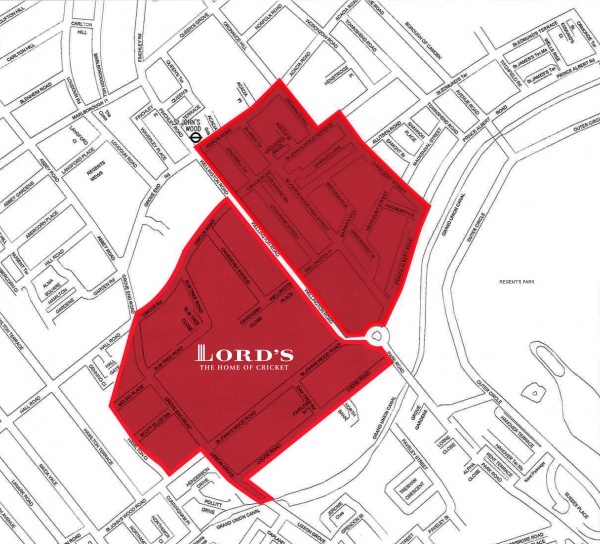 How do I get to Lord’s? For information on how to get to the Ground, please go to our 'How to get to Lord's' page - click here. Can I park my car at Lord's? There is no car parking at Lord’s due to space restrictions on major match days or the three days beforehand, and MCC encourages all visitors to use public transport whenever possible. It is also not possible for non-residents to park in the area below between 8:30-18:30 on Major Match days. If you are disabled, or travelling with someone who is, then do contact the Club Facilities department on 020 7616 8653 or at Clubfacilities@mcc.org.uk. They will be able to sort out drop off and pick up arrangements for you. Can I bring alcohol to Lord's? Lord's is the only international cricket venue in the world where spectators can bring alcohol into the ground. Amounts of alcohol in excess of these limits and any alcohol in excess of these limits will be confiscated. Under no circumstances will any spectator be re-admitted to the Ground at any time during the day if he or she is in possession of any alcohol. M.C.C. reserves the right to confiscate any quantity of alcohol from any spectator. Can I bring my own food to Lord's? Yes, you can bring your own food into the Ground for all matches. It is also possible to order, online, one of our exclusive picnic hampers for two and collect at the Ground on the day of your visit. Orders must be made at least 72 hours prior to the match day. Find out more and order by clicking here. What's the dress code for Lord's? There is no dress code at Lord’s for our general public seating areas, but we don’t permit fancy dress. For information on dress regulations for Hospitality, Members Enclosures and Restaurants please click below. Is fancy dress permitted at Lord's? No fancy dress costumes are permitted for spectators at Lord's. Are flags and musical instruments allowed at Lord's? No flags or musical instruments are permitted at Lord's. Can I bring a pushchair into the Ground? We advise against bringing pushchairs along to the Ground on Test Match Days. You will appreciate that the Ground gets very full indeed, and unfortunately we don’t have any dedicated space for pushchair storage. However, for minor matches - including Middlesex's County Championship & Royal London Cup fixtures, there is sufficient space around the Ground to accommodate pushchairs. Where do I collect tickets on the day? You can collect tickets for the day in question, either in advance of the start of the match, from the Main MCC Ticket Office inside the ground, or on the day in question from the Ticket Collection Point adjacent to the East Gate in St. John’s Wood Road, from Gate Opening time. I’ve lost, left at home or not received my tickets. What do I do? A duplicate ticket, issued as a replacement for any ticket which has been stolen, lost or temporarily mislaid, will be issued by M.C.C. only on production of a written statement by the person who originally purchased the ticket. If stolen, it is imperative that the theft is reported to the Police in order that a crime number can be allocated. This number is to be quoted on your written statement for duplicate tickets. An administrative charge of 10% of the face value will be made for each duplicate ticket. How do I find out if there are still tickets available? The Latest ticket information can be obtained by ringing the Ticket Office on 020 7432 1000, or the Members Dedicated Line shown in your Membership Pass. Are there any returned tickets for major matches? I’m bringing a child. What sort of ticket do they need? Discounted tickets are available for children under 16 years of age, who must be under 16 on the relevant match day. Babes-in-arms may be carried into Lord’s free of charge, so long as they will not occupy a seat themselves. It is recommended that a ticket is purchased for any child over three years of age. I’ve got a child (or adult) ticket but they can’t come. Can I change it? A ticket can be upgraded, or downgraded, but that should preferably be done prior to the match. Can you resell/refund unneeded tickets? For major matches, a Refund Scheme applies subject to the provisions of the M.C.C. General Ground Regulations. Full details are also printed on the tickets. Refunds cannot be made in any other circumstances, or for any other match. If the original applicant has to return tickets to M.C.C. the Club will attempt to re-sell such tickets and a charge of 10% of the face value of each ticket will be deducted by M.C.C. from the proceeds of such sales. All tickets returned in this manner will not be offered for sale by M.C.C. until all remaining tickets for the relevant day have been issued. Under no circumstances will M.C.C. guarantee the re-sale of any returned tickets. It must be noted that tickets may be returned only by the original applicant. Is my seat under cover or is it in the open? It varies from stand to stand. In the Mound Stand, rows with letters (A-E) and row 16 upwards are under cover. Rows 1-15 aren’t. In the Grand Stand, all of the rows with letters and row 11 upwards are covered. In the Compton and Edrich stands, the upper tiers are uncovered but the lower tiers are covered. Members’ Friends’ Enclosures are normally unreserved seating, so it's best to turn up early for more choice. Is there a Late Gate for a Test match? Late Gate is subject to availability, if there is a late gate, it will be advertised via Social Media channels and through the website. If I'm a Member, can I still get Rover Tickets for a major match? The latest ticket information can be obtained by ringing the Members Dedicated Line shown in their Membership Pass. I’m a Member with Rover tickets but I can no longer attend the Match. Can my guests still come? If they are unreserved Rover Tickets, then your guests can come, however, if they are reserved seats, in the Members’ Friends’ Enclosures then they should be accompanied by you. If the original applicant has to return tickets to MCC for re-sale, the Club will attempt to re-sell such tickets and a charge of 10% of the face value of each ticket will be deducted by MCC from the proceeds of such sales. Please note all tickets returned in this manner will not be offered for sale by MCC until all remaining tickets for the relevant day have been issued. Under no circumstances will MCC guarantee the re-sale of any returned tickets. The tickets must be returned by the original applicant only. Applicants are asked to take note of the refund scheme information for each day should bad weather or completion of the match affects the number of overs bowled in the day. This information can be found printed on the reverse of each ticket or contained in the More/Info button on each day on tickets.lords.org. Are there water fountains at Lord's? Yes, we have 25 water fountains at Lord's and spectators are encouraged to bring their own refillable bottles to top-up around the ground. What food and drink can I buy in the Ground? There are plenty of options for food & drink within the Ground and MCC are proud to present the new and improved Lord's Food Village - find out more. Are there cash machines at Lord's? Yes. Lord's has a number of cash machines, which are all free to use. These are located under the Mound Stand, Grand Stand and two are situated behind the Edrich Stand. Do you accept cashless payments at Lord’s? We accept cashless payments at the Ticket Office, Retail Shop and all Food and Beverage points. We accept Mastercard, Maestro, Visa, Electron, JCB, VPay, Amex, Google Pay, Samsung Pay and Apple Pay. Do you accept cash payments at Lord’s? We accept cash payments across the ground. However, in order to speed up customer service at our bars and food outlets, many tills only take card payments including contactless payments. The following bars are exclusively card and contactless payment only. Is there internet access at Lord's? To access the Cloud please see the following steps below. Terms & conditions apply for The Cloud. The Cloud is a BSkyB company. Do you have a left luggage or cloakroom area? We have a small cloakroom area in the Pavilion for the exclusive use of MCC Members who are spending their day in the Pavilion. The Ground gets very full on Test Match days and we suggest you avoid bringing large luggage items with you as far as possible. You will need to keep your bags with you at your seat. You’ll also want to be aware that for the security of everyone here, we search all bags coming into the Ground on Test Match days. What are the timings on a Test match day? Timings can be affected by the weather, and by the progress of the game, but below is general guide for your day. The Gates open to ticket holders at 09.15am. Play is scheduled to start at 11.00am. Please make sure you leave enough time to get into the Ground and to your seat, especially if you want to see the start of play at 11.00am. Lunch is taken between 1.00-1.40pm, and tea from 3.40-4.00pm. The scheduled close of play for the first 4 days is 6.00pm or after 90 overs have been bowled. What time does the Ticket Office open for a major match? The Ticket Office is open to personal callers during a Test Match from Gate Opening until Close of Play. Can I go on a Lord's Tour during a Test match? No. There are no Tours during the Test match. However the MCC Museum is open to the public for free on a match day. During a major match can I book a session at the MCC Cricket Academy? When there is a major match at Lord's, the Academy is closed for net sessions. However, on some major match days the MCC Academy does offer taster sessions. More information on this will be sent directly to ticket holders. During the lead up to a major match it is best to call the Academy on 020 7616 8612 to check availability. I’m a Member, can I take a guest into the Pavilion during the Test Match? Access to the Pavilion for watching the Test Match is reserved for MCC Members only. Can I leave and re-enter the Ground on a Match Day? We operate a pass-out system for all matches at Lord's which allows ticket-holders to leave and re-enter the Ground. On leaving the Ground, you will be issued with a pass which will be needed to re-enter Lord's. You will also need to show your ticket in order to re-enter the Ground. No alcohol can be brought into Lord's following a pass out. How can I report lost property? If you have lost something during a visit to Lord's, please contact our Reception on 020 7616 8500 or by using the email address below.